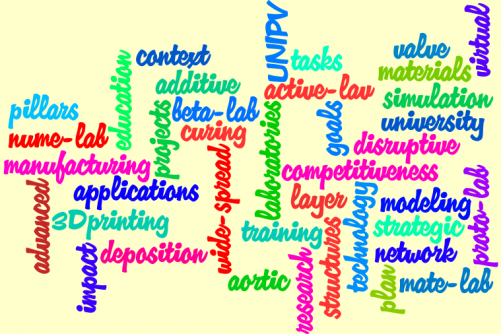 Additive Manufacturing is at the same time a disruptive, but extremely wide-spread and transversal, technology; in this context the 3D@UniPV project has the goals of giving an even further boost toward innovative applications, in particular combining current technologies with two other fundamental ingredients, such as virtual modeling and advanced materials, investigating also social, economic, and legal aspects. The proposed concepts have immediately coagulated a huge interest from a very large part of our academic community as well as from research centers and companies (from local up to international level) and, as a matter of fact, several project members are already actively working toward the project goals. Henceforth, it is clear that the proposed activities represent a strategic direction, which our University could decide to pursue and ride. The term Additive Manufacturing (AM), or 3D printing, indicates a technology where components or complete structures are constructed through sequences of material layer deposition and/or curing. If compared to conventional production technologies (such as casting, stamping, milling, etc. ), AM opens the doors to complete different design and manufacturing approaches. However, despite its already wide availability (3D printers are nowadays even sold with periodicals!! ), we are just at the initial exploitation of such new approaches, with many future innovations, uses, and impacts to be explored. It is in fact clear that AM will soon drastically change not only the production paradigms, but also the distribution chain, leading to whole new implications from the technological point of view as well as from social, economic, and legal points of view.